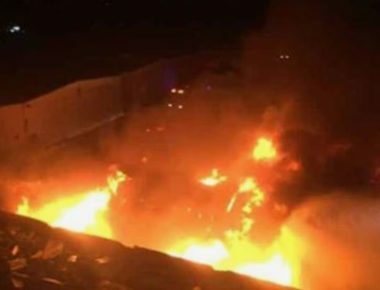 Dozens of Israeli soldiers invaded, on Saturday at dawn, Sebastia town, northwest of the northern West Bank city of Nablus, and started removing Palestinian flags, leading to protests, before the soldiers fired many live round and gas bombs, resulting in a fire that consumed a farm. Mohammad Azem, the head of Local Council in Sebastia, said the farm was burnt shortly after the army invaded the town, due to the large number of gas bombs fired by the soldiers at random, to suppress local protesters. Azem added that many Palestinians suffered the effects of teargas inhalation, and received the needed treatment at the scene. The incidents took place after the soldiers started removing Palestinian flags, raised in several parts of Sebastia. It is wort mentioning that Sebastia is subject to ongoing invasions by the soldiers, and by illegal colonialist settlers, especially in the archeological area.